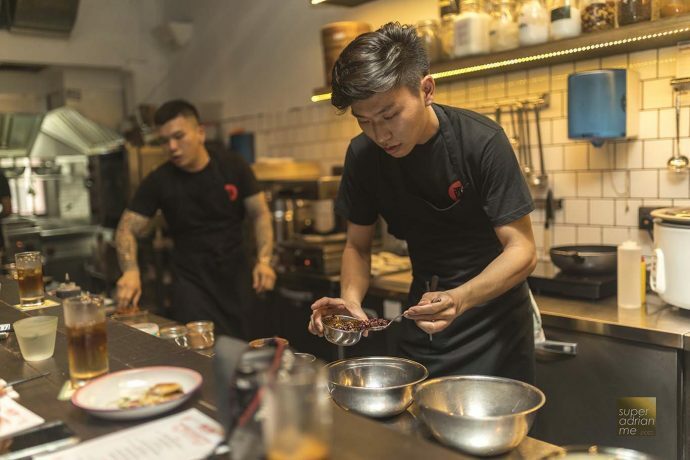 The Establishment relaunches Zui Hong Lou 醉红楼 or Drunken Red House at 90 Club Street, joining its other established outlets including Gem Bar, Nutmeg & Clove, Wanton in Singapore and #FindTheLockerRoom Bangkok. 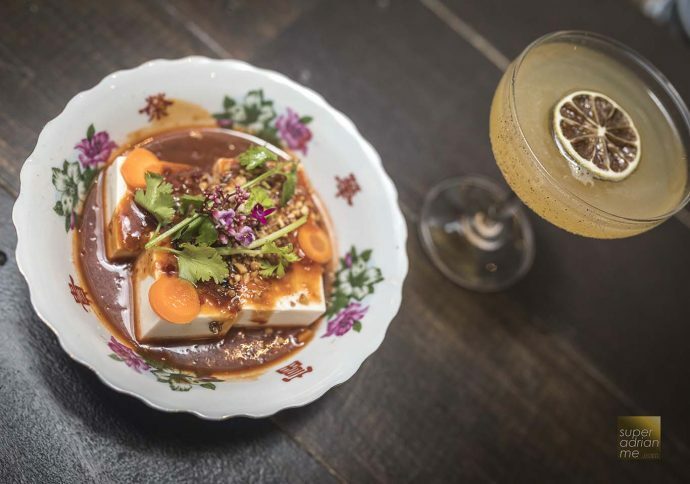 The restaurant first opened in 2013 as a Dim Sum Bar and today it serves up contemporary Asian dishes (I call them everyday comfort food) for sharing paired with cocktails. It’s somewhere I will come back to, after a trip overseas and also missing local food. 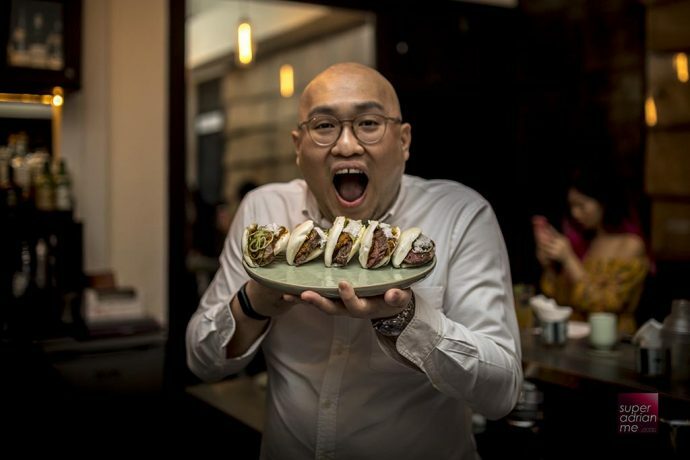 Chef Clement Goh started his career in 2009 and has worked for establishments at The Ritz Carlton Singapore, Tess Bar & Kitchen and Izy Dining. 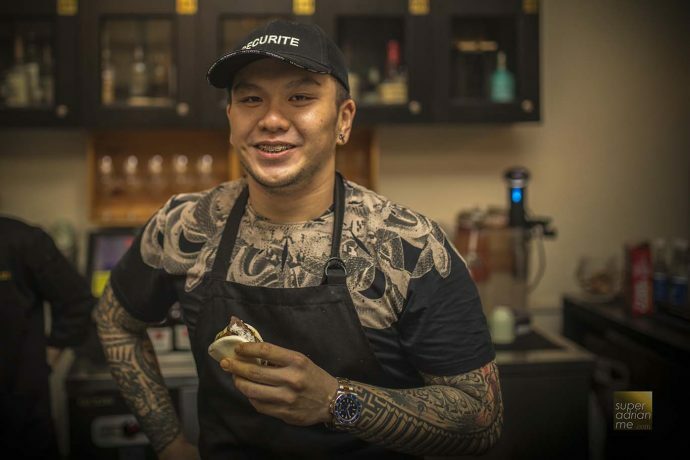 Prior to joining Zui Hong Lou, Clement worked at One-Michelin starred restaurant Bacchanalia. 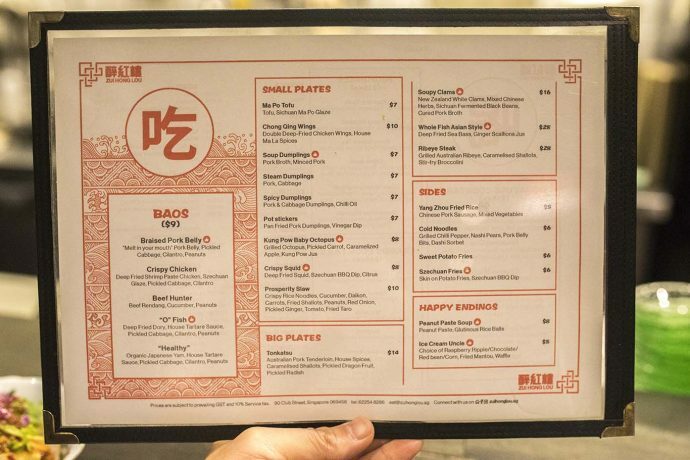 There are a variety of five Baos available on the menu. The braised pork belly, as it is affectionately known as Kong Bak Bao is comfort food after a day’s work. S$9 for two pieces. 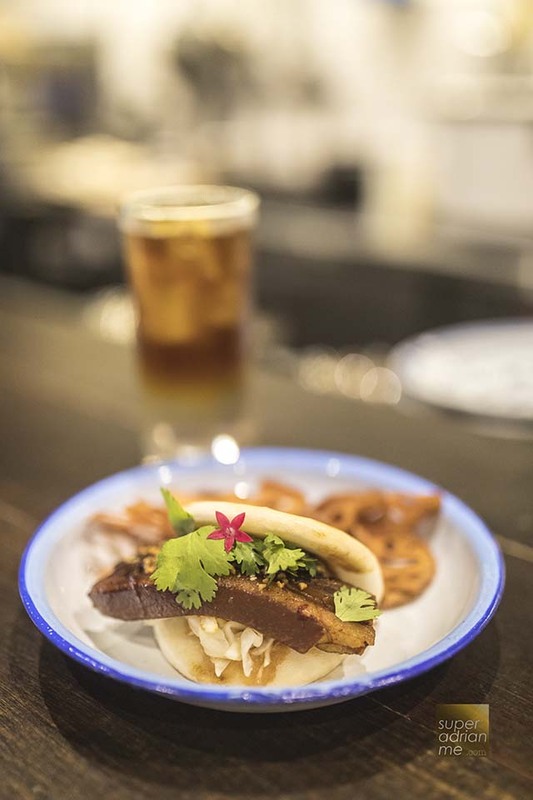 Sink your teeth into the tender pork belly sandwiched in a bao with pickled cabbage, cilantro and peanuts. And the fried lotus root crisps pair absolutely well with any cocktail. The Ma Po Tofu with Si Chuan Ma Po Glaze is priced at S$7 and is mildly spicy. Not overpowering. Just nice. You could have this with Yang Zhou Fried Rice at S$5. Order the Nanhai Magarita for S$16. The Espolon Blanco tequila, smoked plum, Cointreau-infused roasted green tea, lime, Szechuan salt-rimmed cocktail. Who can resist clams? 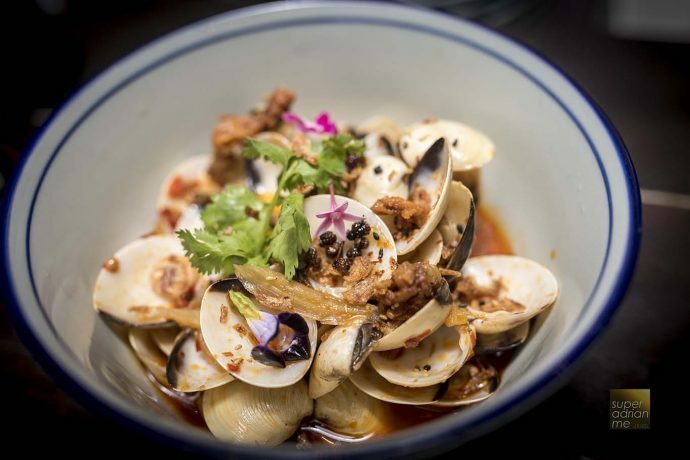 I like the New Zealand white clams with mixed Chinese herbs, Sichuan fermented black beans and cured pork broth at S$16. I just wish they had more broth. 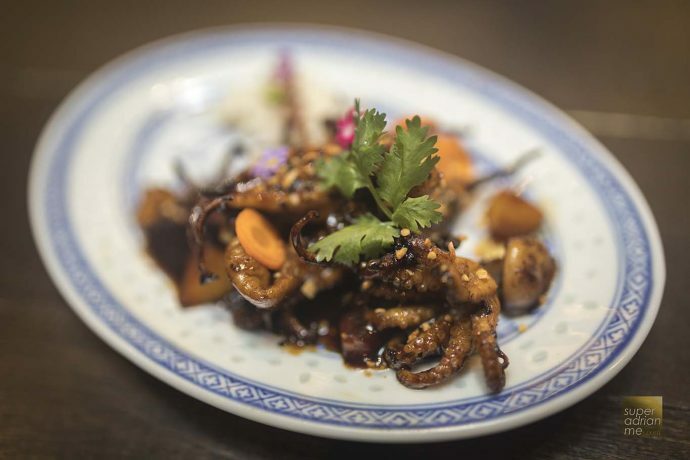 The Grilled Kung Pow Baby Octopus is a must have when visiting Zui Hong Lou. Priced at S$8 this sweet juicy octopus is absolutely divine. 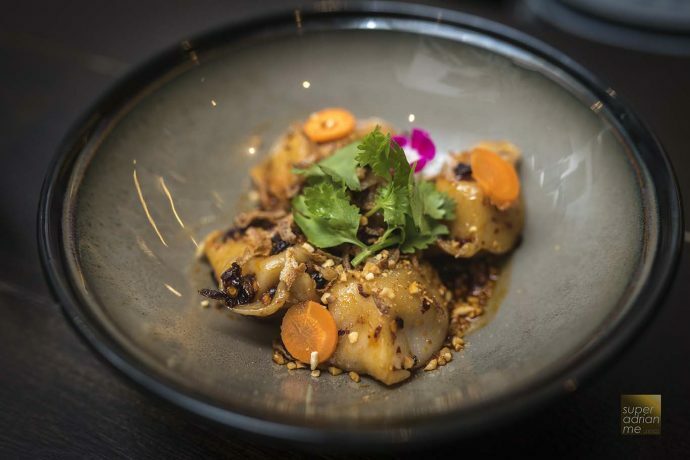 If you are into dumplings, the spicy pork and cabbage dumplings in chilli oil is an interesting dish to pair with cocktails, and definitely not in a bad way. 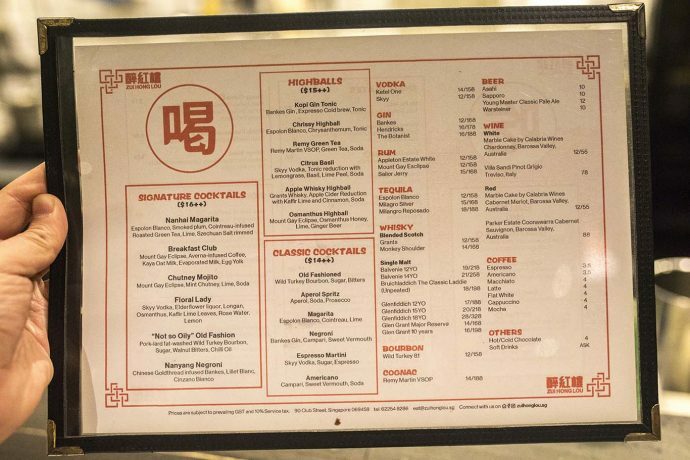 Zui Hong Lou has some tables as well as bar seatings. Sit by the bar and see the chefs and bartender work their craft. Have chats with them and learn more about what you are about to drink. It’s an interesting chaos to watch when it is packed with patrons. Head over with your friends. Give Zui Hong Lou a try any day from 6 pm to 1 am except on Fridays where they close at 2 am. Let us know which is your favourite dish or drink.